English sausages have a definite dual personality. One of those is a sumptuous, succulent blend of good meat, a bit of cereal, herbs and spices and maybe even a touch of the vegetable, like leeks. The other is a staple of the poor. Who knows what unspeakable things lurk inside its wrinkled exterior? But if, like me, you thought that the suspect sausage was purely a product of the industrial revolution, prepare for a revelation. Jan Davison was the second ever guest on the show, talking about the air-cured sausages of Europe’s mountainous regions. Her new book is all about the English sausage, and digs deep into its Jekyll and Hyde past, served at the court of Richard II and hiding tainted meat and worse from the sight of the urban poor. English Sausages by Jan Davison is published by Prospect Books, along with much else besides. Including an enlarged facsimile of William Ellis’ The Country Housewife’s Family Companion, in which you will find his instructions on “How to make complete sausages for sale, or for a private family” along with much else besides, again. 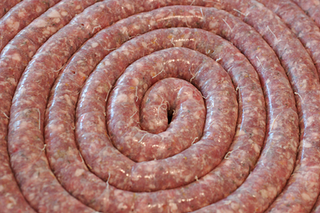 Jan talked a bit about Newmarket sausages, one of many regional specialities and one granted a Protected Geographical Indication (PGI) in Europe in 2012. There was a bit of a spat because the secret recipes of the two main butchers making sausages in Newmarket were different. The two refused to join forces and promote a single secret recipe, so the PGI leaves a fair amount of room for manoeuvre. Cumberland has a PGI too. Cover photo by Flickr member John Giacomoni. Who knows what evil lurks beneath the wrinkled skin of an "economy" English sausage? And what delights won for the Cumberland and the Newmarket their coveted status of Protected Geographical Indication? Jan Davison, that's who. She wrote the book on English sausages and is the guest in this latest episode.